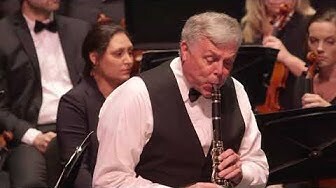 Concerto for Clarinet and Bassoon (Premium Blend) by Mark Sforzini. Premier performance by the Tampa Bay Symphony at the Palladium Theater, St. Petersburg FL — February 20, 2018. Brian Moorhead, clarinet; Mark Sforzini, bassoon; David Stech, conductor For more information on upcoming events, please see http://www.tampabaysymphony.com/.